Marquis Johnson runs up to a wall on the USC campus, plants his hands and pushes off into a midair somersault. His teammates spin around lampposts. Other students passing by the Russell House courtyard between classes watch as Team Fuego Amaterasu Crew shows off its parkour skills. When the sun is out, you can bet Team Fuego Amaterasu Crew, USC’s own parkour and free running crew is out and about — and in the air — running, jumping and flipping off walls. Marquis Johnson prepares to do a handstand off of this brick wall. Free running isn’t the 500-meter dash or long jump that brought the crew’s captain, Marquis Johnson, to USC four years ago. But that passion waned as he feared being a student athlete would be too restricting. Johnson, who is from Concord, North Carolina, says he started watching YouTube tutorials on parkour basics to have something to do once he got to college. He says he saw it as the natural extension of his abilities. Now, Johnson’s life almost completely revolves around parkour and its wall flips and kong vaults. Benches to poles, grass or concrete, no ground remains untouched by Team Fuego Amaterasu. Johnson says there’s a concept in parkour that once you start free running, you never look at structures the same again. View some of Johnson’s free running and parkour tricks on his Facebook page. Visit USA Parkour College, a site that provides various resources for starting a college parkour club. Parkour started as a form of French military training. About a decade ago, people started to do it recreationally, and now it’s a recognized sport internationally. 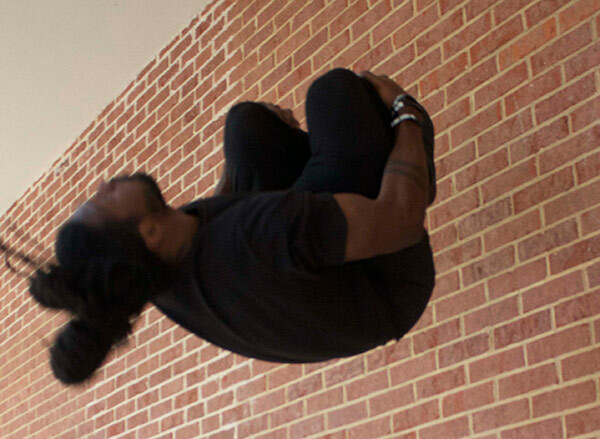 Parkour, Johnson says, depends as much on your creativity as your skill. A few months after starting parkour, Johnson tore his ACL, so doing those jumps has become a matter of training his mind as much as his body. “I’m more afraid of getting hurt than my level of confidence and success in a lot of places, but I’m getting better definitely,” he says. He runs up to the brick wall, flips off it and lands back on the concrete. He’s done it three times in just the last hour, but it’s only today he’s doing it on concrete. “I can look at jumps now and say ‘OK, I know I have the ability to do this,’ and parkour brings more technicality to that,” he says. Click on the image below to watch a slideshow of Johnson and Team Fuego Amaterasu as they show off some of their parkour skills.